Castleford Tigers winged up to second place in the Super League after producing a terrific display to beat Hull 31-24 at their KC Stadium. Wingers Denny Solomona and Jy Hitchcox scored all five of the Tigers’ tries as they let a big first half lead slip, but then came again to upset the previously unbeaten hosts. Cas could not have made a better start as just 89 seconds in they opened the scoring from their first set of the night. Good build-up play involving Grant Millington, Luke Gale and Ben Roberts set Ben Crooks free down the right and he timed his pass perfectly to send Jy Hitchcox over for a try on his debut for the Tigers. Hitchcox was only called up late after the originally selected winger, Joel Monaghan, failed a late fitness test with a back injury. It got even better for Cas on seven minutes when Dorn’s pass allowed Denny Solomona to attack the home line and he showed his usual pace to race in at the corner for a second try. Luke Gale added his second goal and it was 12-0. Back came Hull and after Mark Minichiello was held up over the line and Marc Sneyd’s kick forced a drop-out their pressure told with former Tigers player Jordan Thompson going over from close range. Sneyd goaled. The Tigers dug in and it was they who scored next on 27 minutes when Dorn’s crossfield kick evaded Crooks’ leap and fell nicely for Hitchcox, who showed great feet to nip in for his second try. Again Gale goaled, this time from the touchline, to make it 18-6. Cas came within an inch of another try soon after when a sweeping move ended with a grubber kick by Roberts, which was chased by Crooks. The former Hull centre dived on the ball over the line, but could not get to it before it touched the sideline. Surprisingly referee Robert Hicks did not refer to the video referee and even more surprisingly allowed a quick restart. He followed up with two penalties for the hosts and they took advantage to score as Steve Michaels raced in from Jack Logan’s pass. Hull scored again four minutes later as tired looking defence allowed Jamie Shaul to charge over after backing up Danny Washbrook’s offload. With Sneyd kicking his third goal it was 18-18 at half-time. Cas made the better start to the second half as Dorn was inches away from scoring after getting on the end of Solomona’s pass near the line, Hull defenders getting back to knock the ball clear. Hitchcox was then bundled into touch two metres out after Gale’s high kick had not been dealt with by the home side. Hull’s new crowd favourite Frank Pritchard escaped a card despite hitting Adam Milner in the face, probably more with a flat hand than a punch, but the Tigers did not need an extra man as they forced more pressure to come up with their fourth try on 54 minutes. Jake Webster got a superb offload away near the line and Solomona did the rest with another fantastic finish in the corner. Gale could not add the difficult conversion, though, and Hull went ahead for the first time three minutes later as Shaul backed up Danny Houghton’s break to finish with a flourish and Sneyd added the simple goal. Hull threatened again, but Sika Manu was held up over the line by some strong defending. At the other end Solomona was denied another try when the video referee ruled there had been an obstruction in the build-up by Webster. The hosts were then denied when Michaels put his foot on the touchline as he planted the ball down and it was the visitors’ turn to be relieved. 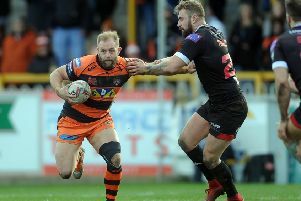 As the game went into the last 10 minutes it was the Tigers who forced the pressure and it was rewarded when they were given a huge penalty on the sixth tackle for an extra tap on Nathan Massey as he was trying to play the ball near the line. Up stepped Gale to confidently send the ball between the posts and it was all level at 24-24. From the next set, Cas drove downfield and Gale landed a drop-goal from a fair way out to put his side back in front with six minutes remaining. Hull tried desperately to pull the game back as they threw the ball about, but just before the final hooter a loose pass was snapped by Solomona who went over for his hat-trick. Gale’s goal put the icing on the cake on a great night for Castleford. Scorers - Hull: Tries Thompson, Michaels, Shaul 2; goals Sneyd 4. Castleford: Tries Hitchcox 2, Solomona 3; goals Gale 5; drop-goal Gale. Hull: Shaul; Michaels, Tuimavave, Logan, Talanoa; Pryce, Sneyd; Taylor, Houghton, Watts, Manu, Minichiello, Thompson. Subs: Ellis, Bowden, Pritchard, Washbrook. Castleford: Dorn; Hitchcox, Crooks, Webster, Solomona; Gale, Roberts; Lynch, McShane, Millington, Holmes, McMeeken, Jewitt. Subs: Milner, Cook, Massey, Moors.